Shantideva was a great Buddhist master from the monastic university of Nalanda in India. He was born to the west of Bodhgaya, in a place called Saurashtra (Khormo Zangpo), which is the present-day Indian state of Gujarat. He was a contemporary of Sheel, son of Shri Harsh. He was given the name Zhewei Gocha. He soon came to be called ‘Shantideva’ because of his calm (‘shant’ in Sanskrit) nature. He was also called ‘Busuk’ as he remained absorbed in a meditation called Busuk. As he was extremely quiet, peaceful and simple, his fellow student at Nalanda thought that he was foolish and gave him the name Busuk, meaning someone who care only about three things – eating, sleeping and defecating. In reality, he was a real Busuk, a term that come in the Highest Yoga Tantra (Annutarayoga Tantra) and refers to a conduct totally free from fabrications. He was thus a hidden yogi. He definitely lived during the seventh century. As a child five or six, he met a highly accomplished yogi who was observing a concealed discipline. He received from him the teaching on the means of achieving Jhampal Ngonpo (jhampal Dorjee Ngonpo, one of the many names of Manjushri), and became deeply engaged in meditation, recitation, offering and praises. Before long, he got a direct vision of Manjushri – embodiment of everything that is beautiful in the world. After his father passed away, minister and subject of the Kingdom request him to become the king. But the prince realized the fluctuating nature of the conditioned world. Isolation is the source of happiness that is harmonious with virtuous practices, while remaining at the home is an antidote to morality and thus did not attract him. Upon reaching Nalanda, he received novice monk ordination from the abbot Gyalwei Lha. Having ordained, he defeated all external forces of distraction along with the poisonous forces of afflictive emotions, and was particularly eager to partake of the nectar of the teachings of Manjushri. Whatever teaching he received, he remained concentrated in them. Provoked by great compassion for future followers which was comparable to a mother’s for her only child, Shantideva spent his time in the activities of s learn being by composing authentic texts. However to those who were not sublime beings, he did not seem to be doing anything other than enjoying food, sitting casually and going around. Thus out of ignorance, they called him ‘Busuku’, as mentioned earlier. To test him before a gathering of all the monks of the glorious Nalanda, his detractors prepared a high throne lifted by five fearless lions and thought that we would not know how to climb on it. But Shantideva pressed the throne a little with his hand and climbed on to it without hesitation. Those who had resented him earlier now become doubtful. 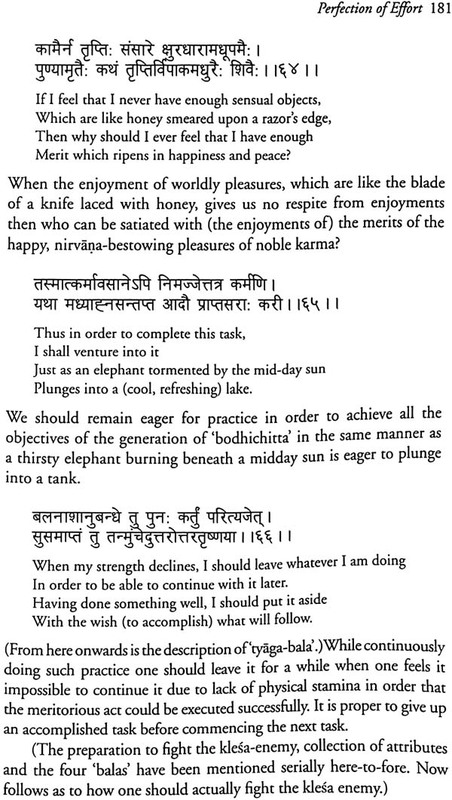 Then, radiating light with his smile, Shantideva said “Shall I read a sutra that has been read before or one that has never been read before?” When he was requested to read one that had never been read before, Shantideva taught his Bodhisattavacharyavatara (‘Living the Way of life of a Bodhisattawa’), an excellent text that filled the mind of countless followers with peace, ensuring the attainment of unsurpassing, supreme enlightenment. As he taught the lines, “Since there is no thing or no non-thing”, he miraculously flew into the sky, and his body disappeared while still reciting the chapter on dedication. After some time, the Nalanda scholars heard that Shantideva was living in a stupa called Palyonchan and two bhikshus were sent to invite him. Shantideva mentioned that the exact length of the text is the one collected by the people from the central land. The two texts, Compendium of Precepts (Shiksha samuccaya) and Compendium of Sutras (Sutrasamuccaya) were within the pillars of his meditation room written in small Pandita letters. These he explained to them, as well as the way of practice. 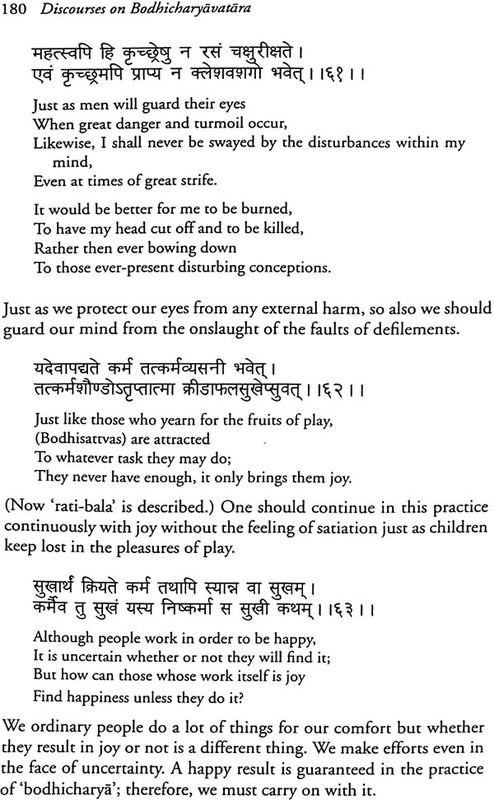 Shanideva composed this great work ‘A Guide to the Bodhisattva’s Way of life’ (Bodhisattavacharyavatara) in the seventh century of the Christian Era. 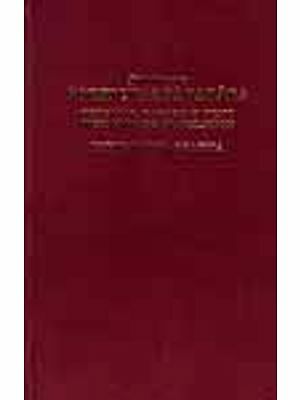 In India at that time, Mahayana Buddhism was well-established and in the thousand or so stanzas of this text, we find a concise yet comprehensive account of the principle feature of this doctrine. Shantideva has been renowned in Tibet as one of the most reliable of teachers. 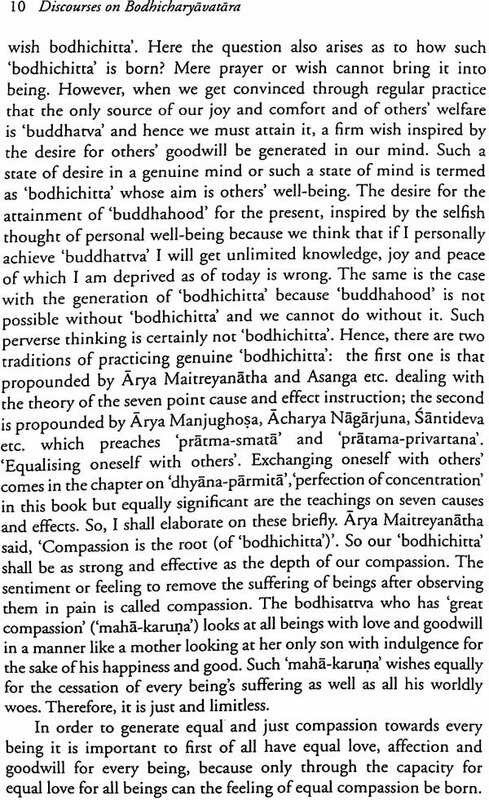 Since this text mainly focuses on the cultivation and enhancement of Bodhichitta, it belongs to Mahayana. Shantideva particularly follows the Prasangika Madhyana. 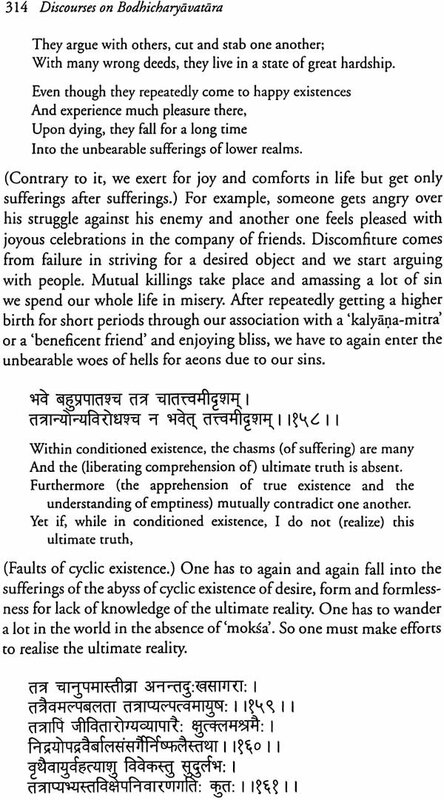 Shantideva particularly follows the Prasangika Madhyamika viewpoint of Chandrakirti. According to this scheme, the first three chapters (‘The Excellence of Bodhichitta’, ‘Confession and ‘Commitment’) are desgned to stimulate the dawning of Bodhichitta in the mind. The following three chapters (‘Awareness’, ‘Vigilance’, and ‘Patience’) give instructions on how to prevent this precious attitude from being dissipated, while are seventh, eighth, and ninth chapter (‘Heriic Perseverance’, ‘Meditation’, and ‘Wisdom’) prescribe way in which Bodhichitta may be progressively intensified. The tenth chapter is a concluding prayer of dedication. According to tradition, ‘The Way of the Bodhisattva’ was first translated into Tibetan in eighth century by the Indian master Sarvajnanadeva and the Tibetan translator Kawa Peltsek, using a manuscript from Kashmir. It was later reworked during the eleventh century by the pandita Dharmashribhadra and the translator Rinchen Zangpo, on the basis of a manuscript and commentary from Magadha. A final revision was made by the pandita Sumatikirti and the translator Loden Sherab. Buton Rinchen Drub, a renowned Tibetan scholar of the 13th century, wrote in his ‘History of Buddhism in Indian and Tibet’ that according to Buddhist tradition, 100 commentraies on the Bodhicharyavatara were extant in India, but only eight of them were translated into Tibetan. According to the scholar, Vendal, Shantideva’s works show traces of Tantric influences Shri Guhyasamaja-mahayoga tantra-balividhi. According to a palm leaf manuscript (talapatra) in Nepal, named “Charyscharyavineshcheya’, Busuk has written several other volumes on Vajrayana and it was also written that he was from Bengal. 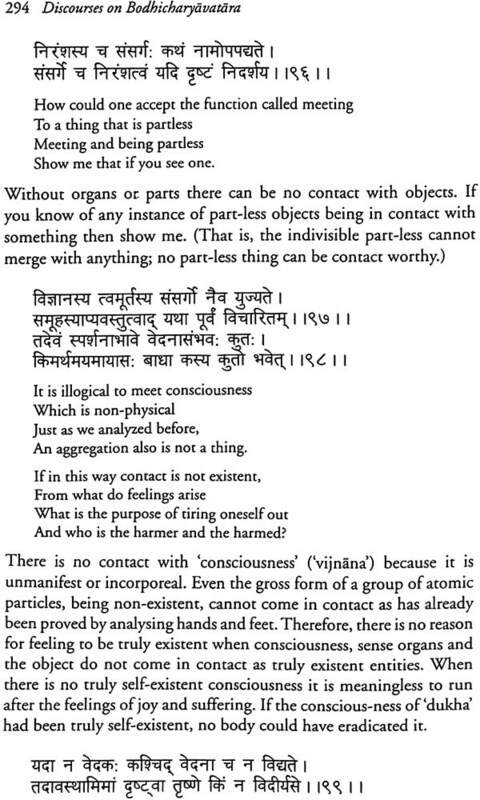 For example: “Prajaparamita Ambbhodhiparimathnadhmrat-paritoshidh-siddhacharya Busuk-padho Bengali-kavyajain-tamevarth Pratipadhyati,” and so on. And interestingly, the songs attributed to him seem to belong to this period. It is also mentioned that he passed away between 648 AD to 816-838 AD in the forest when his works got started translating in Tibet. I am very happy that this very precious text of Bodhicharyavatara which LTWA first published in Hindi is now to be made available in English. 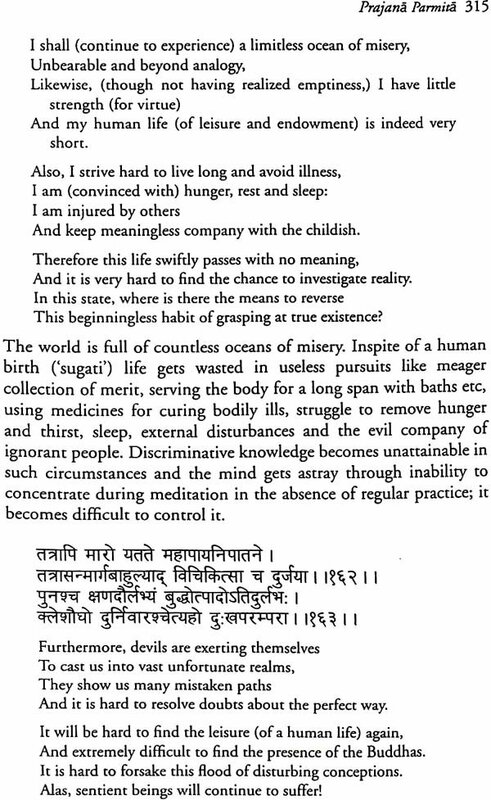 It is befitting that the translation of this precious text into English from Hindi is done by Professor Sharma. His great scholarship in Hindi, Sanskrit and English plus his devotion to spirituality and His Holiness the Dalai Lama, enables him to draw the flavor and the essence of the teaching in lucid terms. He earlier produced the two volume English translation and exposition of Boddhicharyavatara from original Sanskrit text based on Prajnakaramati’s Panjika. This current translation is purely a work of selfless service and it is wonderful to see such spirit and energy at such a ripe age. I salute Prof. Sharma not only for his erudition but also his highly altruistic motivation. It is without question that this translation will benefit many readers in sowing the seed of compassion, Bodhichitta and wisdom-realizing emptiness. It is an honour that LTWA is able to publish this translation. Bodhicharyavatara, composed in the 8th century A.D. By the Indian monk-poet Santideva, is one of the most celebrated texts of Mahayana Buddhism. Its Tibetan translation is included in the Tengyur. Acharya Santideva himself was a bodhisattva and a realized tantric adept and his writings have a universal, timeless appeal. Many ancient scholars wrote Sanskrit commentaries on Bodhicharyavatara, prominent among them being Vibhutichandra, Krishnapada, Kamalsila, Vairochan and Prajnakaramati. Besides its Tibetan translation by such masters as Sarvajnadeva, Dharmasribhadra and Sumatikirti, this great classic was also translated into chiness, French, German, English and Italian Languages. The present work is an English translation of Acharya Karma Monlam’s Hindi version of His Holiness the Dalai Lama’s discourses on Bodhicharyavatara published by the Library of Tibetan Works and Archives, Dharmasala. Significantly, these discourses were delivered in an eight –day long marathon of dharma teachings in the beautiful Himalayan resort of Manali in Himachal Pradesh to an audience of Himalayan devotees from Lahaul, Spiti and Kinnaur and the Tibetan exiles settled there. His Holiness’s revelation during the discourses that he held himself received his teaching from the great Himalayan master Mahasiddha Khunu Lama of Kinnaur came as a soothing balm to the listeners’ ears. Whose words can be more authentic than those of the living bodhisattva, His Holiness Tenzin Gyatso, the Fourteenth Dalai Lama? This book contains his words in their English version. His Holiness has practiced and lived these teachings all his life. He is an epitome of ‘prajna’ (wisdom) and ‘samatha’ (calm-abiding): a ‘kalyanmitra and a boon for manking whose religion is Beyond religion. It is only proper that his words of wisdom should reach the English-knowing readers and seekers of bodhichitta. It is essential for you to know something about the author of Bodhicharyavatara on which I am commencing my brief discourse today. Acharya Santideva, in this normal conduct, was a follower of the Vinaya tenets: a bodhisattva in inner discioline and ultimately a tantric siddha. Of his many works for studying and teaching, ‘Siksa-sammuchya’ and ‘Bodhicharyavatara’ are very important in their Tibetan translations. Universal in this appeal, Bodhichartavatara, in spite of its brevity, earned great popularity amongst the Buddhists of India; Many Indians wrote commentaries on it and spread its teaching in the public at large. Likewise, every tradition in Tibetan owned it and it and a number of Tibetan scholars’ commentaries on the text are extant. I received its teaching from Ven. Khunu Lama Tenzin Gyaltsen. I try to live up to its teachings in my daily life. If incapable of practicing in my conduct, I, out of reverence for the teachings, pray to be proficient in the practices. The plan of this classic work is very impressive and contemplating on it itself has a profound influence on one’s mental traits. I think I have thrice thrice discoursed on Bodhicharyavatara earlier but I consider myself fortunate to be able to have another opportunity today to give an exposition of its teachings. Those gathered here today are equally fortunate and should diligently listen to the teachings. Named as ‘Bodhicharyavatara’ the book is also designated as ‘Bodhisattvacharyavatara’ at places. The word ‘bodhi’ (‘jangchub’) attached with the nomenclature is a word of deep significance.’ Jangchub’ or ‘bodhi’ denotes the attainment of the knowledge of all that is knowable in all its perfection and to coalesce it with your mind. Thus the world ‘bodhi’ here indicates ‘maha-bodhi’ or (‘jangchupchenpo’). 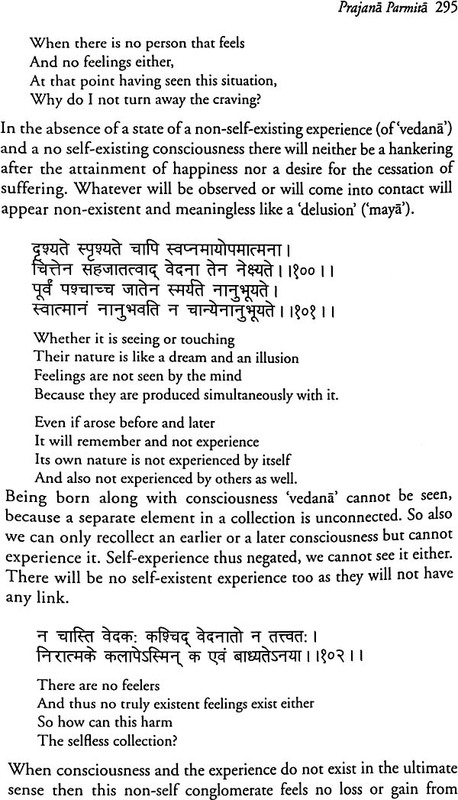 Such ‘bodhi’ is the noblest ‘bodhi’ or ‘buddhatva’ (i.e. Enlightenment). Those wishing to attain such ‘bodhi’ through practice are called ‘bodhisattvas’. Practice is of three types: ‘pranidhana’ or the ‘generation of bodhichitta’ , ‘prasthapana’ or ‘practical practice’ and ‘lakshya’ or ‘dharma-kaya’ generated by ‘karma’ or ‘actions’. This book, which helps our introduction into such practices, has been designated as ‘avatara’ and the classic is named ‘Bodhicharyavatara’. The first of the ten chapters of the book is in praise of the virtues of ‘bodhichitta’, because only an acquaintance with its quality could encourage an aspirant to take to it. Hence, ahead of all else, its special qualities have been enumerated. 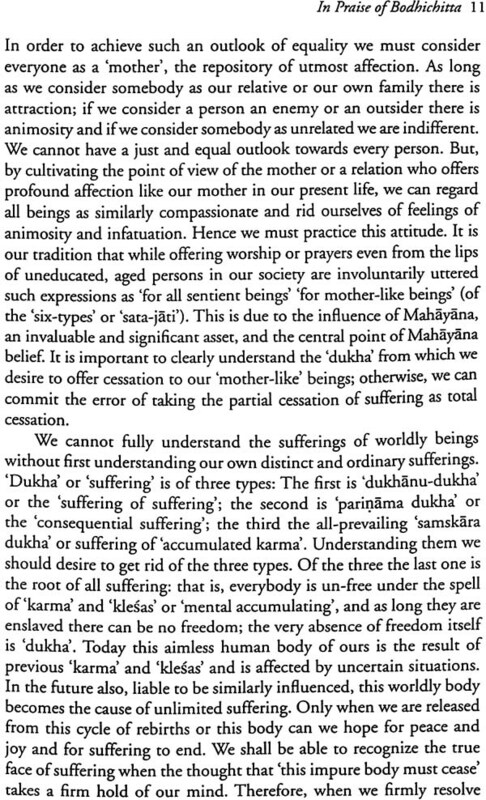 Seeking refuge and the eight brance practice have been explained in this context here. In verse sequence the second chapter is ‘papa-desana’ or the ‘confession of sins’. The third chapter is ‘bodhi-chitta-prigrahana’ or the ‘acceptance of bodhichitta’, which expostulates the other means for generating and embracing ‘bodhichitta’. For the purposes of practice hereafterthey are described as the six ‘parmitas’ or ‘perfections’; however, ‘dana-parmita’ or the ‘perfection of giving’ has not been dealt with in a separate chapter but it is scatteringly present in other chapters and especially the 10th (‘bodhi-parinamana’ or ‘dedicatiuon of bodhi’ (wherein body, wealth, merit etc. have been enumerated as offered for others). Instead of emphasizing the nature of ‘sila’ or ‘conduct’, the means of its purification have been dwelt upon through ‘apramada’ or ‘effort’ and ‘samprajanya-samraksana’ or ‘recollectiveness’ in the 4th and 5th chapters. A chapter each is devoted to the topics of ‘ksanti’ or ‘forbearance’, ‘samadhi’ or ‘absorption’, ‘veerya’ or ‘effort’ ,’dhyana’ or ‘meditation’ and ‘prajna’ or ‘wisdom’ perfections. With the inclusion of ‘parinamana’ or ‘dedication’, the work comprises ten chapters in all. The exposition of the subject matter of ‘Bodhicharyavatara’ is, one the one hand, based on the expansive meaning of Acharya Maitreyanatha’s principle of ‘upaya’ or ‘skillful means’ as described in his ‘Abhisamayalankara’ and ‘Sutralankara’ etc, on the other hand the subject of the practice of ‘bodhichitta’ is based on Acharya Nagarjuna’s ‘Ratnavali’. Although the tradition of Arya Maitreyanatha and Asanga has also been appropriated in the generation of ‘bodhichitta’ but more emphasis has been laid on the principles of ‘pratma-samata’ or ‘equality between oneself and others’ and ‘pratmaparivartana’ or ‘exchanging oneself with others’ as propounded in Acharya Nagarjuna’s ‘Ratnavali’ and expounded by the likes of Acharya Budhapalita. The principles of Acharya Nagarjuna on the theme of ‘prajna’ or ‘wisdom’ have been accepted as the basis. Every book has three divisions: beginning, middle and end. The name of the work, the writer’s obeisance or ‘namaskara’ and the vow to write come in the beginning. The Sanskrit name of this work is ‘Bodhicharyavatara’;it is ‘Jangchub sempei-chodpa la jugpa’ in Tibetan. ‘Sarva Buddha-bodhsattva-bhyo’ is the writer’s obeisance. Buston’s work states that as Santideva’s work is an exposition of the sutra so its author has offered obeisance to Buddhas and bodhisattvas.In ancient times, Sanskrit was translated into Tibetan but today Tibetan is going to be translated into Hindi. Bharata has been called ‘arya-bhumi’ in which many religions, creed and concept have taken birth and truly a great country it is. Innumerable concept-holders, judicial scholars and great ‘Siddhas’ or ‘realised seers’ have been born in the land whose scholarship can be fully estimated from their commentaries on their creeds and concepts are their judicious analysis. If we study without prejudice such work on religions and creeds very significant resources of knowledge will be at our disposal. However, if we study these scholars’ works without an understanding of their basic principles the exercise can be very harmful too. Instead of merit we will only earn sin by studying these works with pre-conceived prejudice. Therefore, all followers of religions should maintain goodwill. Correct knowledge and practice of whatever religion or creed one adheres to is essential. Every religion, Hinduism, Islam, Buddhism, Sikhism, Jainism, Christianity and Judaism teaches one to become a good human being so we must have a feeling of reverence and goodwill towards all religions. Simultaneously, it is also important that, while maintaining good will towards other religions, one must have a full and deep understanding of one’s own religion instead of mere Faith in it.